Escape the city and take the short 75min cruise to idyllic Moreton Island, the third largest sand island in the world. Located just 40km from Brisbane Moreton Island boasts stunning beaches, huge sand dunes, beautiful lakes and an abundance of wildlife. Tours and activities on the island include snorkeling the wrecks, quad biking, sand tobogganing and whale watching. 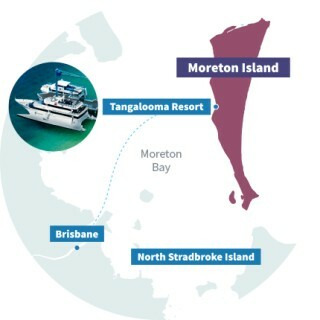 World famous Tangalooma Resort is Moreton Islands most popular and accessible location. As well as 4-star accommodation and facilities the resort offers multiple day tours departing from Brisbane CBD. 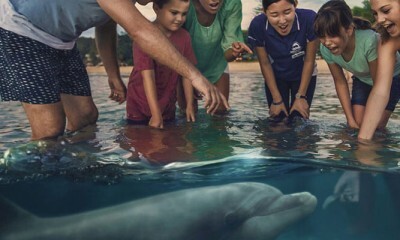 It is also one of the few places in the world where you can hand-feed wild dolphins! Return trip to Tangalooma Resort on Moreton Island. 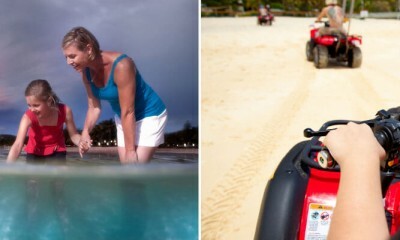 Spend up to 6.5 hours at Tangalooma Resort and enjoy unlimited use of the resort facilities. Includes lunch voucher. Spend the day on beautiful Moreton Island enjoying the facilities of Tangalooma Resort. Includes a Desert Safari Tour or Marine Discovery Cruise and transfers.